Can hot tubs cause rashes? What causes hot tub rash? "Better known by its medical monikers, dermatitis or folliculitis than hot tub rash, this skin infection is contracted from long exposure to water that is contaminated with the germ Pseudomonas aeruginosa (sue-doh-MOH-nass). The germ enters the skin through an injury or hair follicle. The same germ also causes swimmers ear. The disease, while it sounds complicated, is fairly easy to treat. It can affect anyone of any age who has been exposed to water that contains the Pseudomonas aeruginosa germ. In most cases the rash will go away on its own after a few days." Absolutely if they are not cared for properly. Hot tub rashes are caused by a tiny, invisible germ called Pseudomonas aeruginosa that enters the body through a skin trauma. A hair follicle is a common point of entry. When the infectious material collects in the tissue and dermis it forms a carbuncle or pimple. The infection begins to spread as a superficial skin infection. Unfortunately, this particular germ is very common in our every day environment and can be found in soil and water, water slides, loofah sponges and physiotherapy pools. Being that it’s classified as microscopic, you can’t see it with the naked eye. The warm environment of the hot tub provides an ideal breeding ground if the chlorine, bromine and PH of the tub or swimming pool are not at the ideal levels for disinfection. 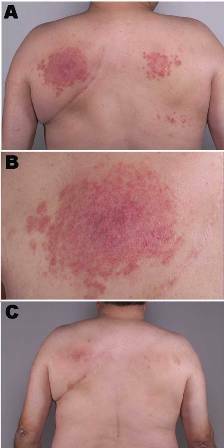 How Quickly Will Hot Tube Rash Symptoms Appear? Symptoms can appear within 24 hours after being exposed. Most people see symptoms in about 48 hours with a range of 8 hours to 5 days after exposure. The first signal that you may have hot tub rash will be the rosy red and itchy rash you display on your body. It does not always show up right away, and in fact, you may not see any signs of it until two to three days after you have been exposed to the germ. You may be exposed to it in a poorly maintained hot tub or contaminated pool or even by swimming in a lake. More often than not, children tend to get hot tub rash, simply because they spend a lot of time in water. How Long Does Hot Tub Rash Last? Generally speaking, hot tub rash folliculitis will only last for about seven to ten days. However, if it does not and you have an allergic reaction in addition to the rash, see your doctor. It should be noted that the chemicals used to maintain hot tubs, spas and swimming pools may also give you a rash after being exposed. This tends to make it a bit more difficult for your physician to diagnose, but both conditions are easy to treat. Just try not to scratch or you could make the hot tub rash worse. The rash is not spread from person to person by the eruptions on your skin. The eruptions do leave behind small hyperpimented lesions that slowly fade over time. Why Are Hot Tubs and Whirlpools Favorable for Hot Tub Rash? Hot water temperatures enhance the growth of the P. aeruginosa bacteria. The hot water opens skin pores which enables the bacteria to enter. Organic skin matter on humans provides nutrients for the bacteria to grow. Jets or other water turbulence interferes with disinfectant in the water, particularly if the whirlpool is made out of wood. Video and interview with Dr. Matthew Zirwas from Ohio State University Medical Center on the sudden increase in hot tub allergies and skin reactions. An allergic reaction to hot tub is possible while rare. People become allergic to a chemical in the hot tub called potassium monosulfate. It causes intense itch and red, flaky skin. The way you can tell if you have a hot tub allergy is to only put your feet into the tub at first. If you develop itch and a red rash on your legs, then the cause could be hot tub allergy. There are also other chemicals you can use which may solve the hot tub allergy problem. When you get to your doctor’s office, they will take a good look at your rash and its location and then start asking you questions about what you have been doing recently. While the itchy spots on your skin that have turned into a raised, red rash may well be hot tub rash, the symptoms are common to other skin rashes. This is why the doctor needs to rule out what you have been doing or what you may have been exposed to lately. The rash is usually worse in areas that you had covered by a bathing suit, so that is generally a pretty clear signal that your rash is the result of Pseudomonas aeruginosa. Your doctor will also notice that the hair follicles are surrounded by pus-filled blisters. There will be several very small “papules” with a pustule in the middle. You may also experience some fatigue for the first few days, but this germ typically does not produce a fever. While this rash may appear just about anywhere on your body, the parts of your body that have been in contact with a wet bathing suit usually have more skin lesions. A doctor can also culture a pus-filled pimple. Luckily, most cases do clear up within seven to ten days without any intervention. However, if you need something to help with the itch, here are a few things to try. Vinegar compresses for 20 minutes at a time, two to four times a day. Acetic acid kills bacteria. Sitz baths with luke warm water and baking soda, peppermint or oatmeal, twice a day for 20 minutes at a time.